Response: After you succeed at a story, discard 2 success tokens from that story. Flavor Text: My goodness! 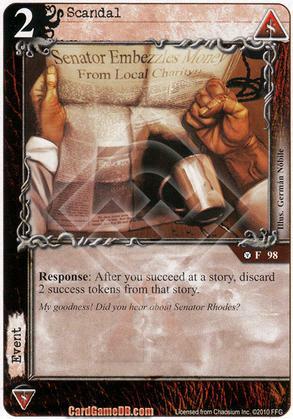 Did you hear about Senator Rhodes? Scandal only seems worthwhile in situations where you're trying to swing a story, which is something I rarely try to do. If the story is really nasty then I might try to swing it. Ditto if my opponent is 1 story from winning the game. Otherwise, I'm rarely trying to win a story out from under my opponent because it's so hard to do. Scandal does make that more likely, so it's a nice option to have. Unfortunately, the opportunity cost and the >1 cost mean it's rarely worth running. A cool card for a niche worth exploring but a niche nonetheless.